The UK has only 6 big energy companies but over 3.000 residential solar installers. This number of solar installers has been dropping in the last year and currently shows signs of stabilization, despite a market that is smaller in both the number of installations and the value per installation. This means larger installers with multiple offices continue to compete directly with sole traders to win over the same consumer. What are the reasons that residential solar does not show clear economies of scale, and what can be expected for the future of this industry? 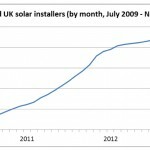 The residential solar market in the UK has grown dramatically since the introduction of the Feed-in-Tariffs in 2010. The number of MCS accredited installers showed a massive increase from just over 100 in July 2009 to a high of 4.350 in July 2012, only to drop again towards 3.000 installers at the moment (see first graph). The weekly number of residential installations per installer used to be remarkably stable around one installation per installer per week for the initial period of the high feed-in-tariff. Simply said, when the market was booming new installers joined to share the pie. Following the turbulence of Feed-in-tariff cuts, the number of installations per installer is slowly growing back towards this same number, most likely driven by a slow increase in installations and a slow decrease in active installers. But how can a mature market exist where each week on average only one product is sold per company? The answer seems to be a lack of economies of scale. Normally, big companies can deliver the same product or service more efficiently than small companies. Their relentless focus on specializing tasks lowers fixed costs while their higher sales volume both reduces variable costs and spreads out the lower fixed costs over more units. But in UK residential solar this is not taking place, and sole traders continue to compete effectively against bigger firms. Large solar installers do have the advantage of doing certain tasks more effectively by e.g. having a centralized customer service, finance and marketing operation, as well as obtaining lower prices for buying panels and inverters. However, this benefit is limited due to a well-established network of wholesalers that offer small volume discounts. And large installers do incur more costs for offices, management and most importantly by maintaining both a sales force to perform site visits and installation teams to do the actual installations – which makes them less flexible. This has been hard in times of strongly fluctuating demand like in residential solar during the FiT cuts. Sole traders need to do their own accounting, purchasing and marketing, as well as visiting customers, doing quotes and installing solar systems. This can take more time than large companies, but does not require additional employees on the payroll. They also lower overhead costs due to e.g. working from home, no need for warehouses, less internal communication and focus on word of mouth marketing. Most importantly, small installers are more flexible in their capacity management of doing site surveys and installations. They often focus on a smaller and more local area, hence less time is lost driving and the consumer appreciates the local nature. Also they can easily switch between office jobs, site survey and installation tasks, which mean no time is lost. And since each roof is different, they perform site surveys and installations with a similar efficiency as large firms. But economies of scale have been achieved in other solar markets. Free-solar companies have a strict online pre-qualification process, a high sales conversion and a focus on standardized installations. Commercial projects with e.g. housing associations only require one selling process and also focus on standardized installations. And in the USA companies like Sunrun and SolarCity have achieved economies of scale through selling solar as a financial leasing product. The buy-it residential solar market in the UK could learn from these examples. The financial tools do not apply by definition, and residential installations will remain less standardized due to the diverse nature of individual houses. But a stronger focus on pre-qualification before the site survey and hence increased sales conversion is entirely possible. Based on anecdotal evidence, installers can do up to ten site surveys in order to get one sale, which is simply too costly. More focus on using online tools to pre-select the right customer with a good roof, the money readily available and no issues with EPC requirements is key to focus site surveys on only the most promising prospects. The site survey remains mandatory due to the MCS requirements, and should be used only on those prospects that are likely to be actual buyers. Economies of scale seem to be limited in UK residential solar. Small firms that are focused and flexible are likely to remain competitive against larger firms. Buying solar from a local installer also has the preference of many consumers. Could this be why the big six utility firms fear a legion of small residential solar installers? Note: this article will appear in the December issue of SolarBusinessFocus magazine.